Today’s lesson was a doosey. I really don’t think I was prepared for it, even though I had previewed it last night. I guess maybe I’m far more rebellious than I believed myself to be. Maybe not so much in action, but in thought. Of course, our thoughts do dictate our actions. Today was a lesson in humility for me, and not one I enjoyed. I’ve memorized all three of these verses over the years, but never have I made the connection that they fall in succession in 1 Peter. Humility, anxiety, self-control… they do seem to be linked. I sat for a bit considering these verses and saw how very rebellious I have been when it comes to turning this struggle over to God. And then the author hit me square between the eyes on the next page. This is my body and I can do with it as I please. Gulp. I would have never said I was someone with this attitude. Never. And when I first read it, I thought, “that’s not me.” I thought maybe I was the exception to this. Ha ha. See, the lack of humility… the rebellion. So, as with other times during this study, I asked God to show me if this was true or not. Part of me prayed, “please say it isn’t”. Well, it is. It goes back a ways and it’s deep, but it’s true. 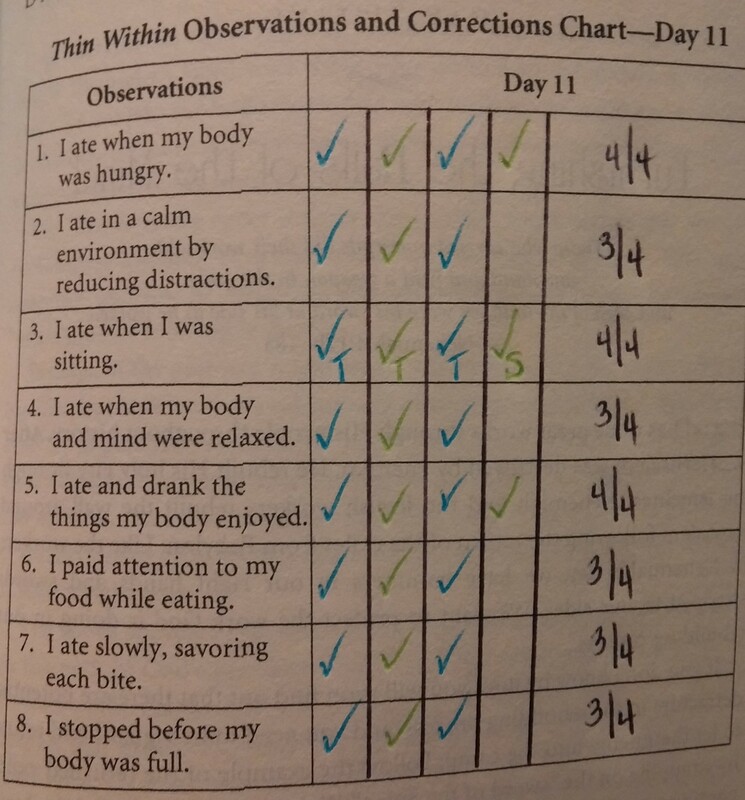 I won’t be sharing the specifics, but at some point along the way, I determined that I could have control over whether I ate or not and what I ate. When you feel like so much is outside of your control, sometimes you’ll cling to what you think you can control… and then attempt to control the heck out of it. Women use this belief as a license to do all sorts of things. For me, it’s eating when and what I want. It’s putting my body through ridiculous regimens to whip it into shape. It’s body worship. Unfortunately for the rebel in me, it’s a lie. Eh Hem. I’m really not sure it could be said with more clarity than that. “NOOOOOO”, screams my inner rebel (the flesh). I just sat and stared at that verse. How many times have I read it… oh probably too many to count. Yet, here it is, plain as day, exposing my rebellion with such conviction I can hardly stand it. Ok, so in light of what I’ve already written, you can imagine that the next exercise was really difficult for me. It was acknowledging lies I’ve believed about my body. Not all of the ones listed are lies I’ve believed, but most of them are. A couple of them I had difficulty applying the verse that the author gave as reference to the lie, but in reality, do I need to apply any other verses but 1 Corinthians 6:10-20? I think not. If my body is not my own, they are all lies… period. It was really difficult to apply sin labels such as “greed”, “gluttony”, and “self-indulgence” to some of the lies. It rather made me feel sick to visualize. Apparently my old “club of condemnation” was readily handy. After a few swift mental whacks, I realized that I was allowing condemnation in and quickly shifted my focus to applying God’s grace. The author points out that the enemy’s goal was to deceive me into believing these lies… but… “greater is he that is in you, than he that is in the world!” (1 John 4:4, KJV) Praise God! Halleluiah!! Lord, help me to remember that my body is not my own! The timing of this lesson was exactly where it should be in the process. While it was rather painful, there is a sense of relief that I don’t have to “fix myself by myself”. That is God’s job because this body belongs to Him. My job is to do what He says with it… and He even provides the means and the strength. Not a bad deal. I am still struggling with the TV watching thing. I know I’m doing it in my own strength because tonight I thought I could manage it. I started out being present as I ate, but autopilot took over. I still haven’t put that verse on the coffee table like I planned to do the other day. I’m going to keep turning it over to God though. He knows what will break the pattern and maybe I’m just not ready for that step in the process. I know He’ll bring about change in due time because I really do want to behave differently. On another note, after praying and asking God if I should, I tried on those “goal set on day three” pants today. I was shocked to discover that I can almost button them while standing. Now, they are entirely too tight to wear in public, but I couldn’t even make the opening meet on day three. So, I am shrinking, despite my obvious issues with “sofa eating”. *Remember that this post series is not in “real time”. Today’s lesson fell on a Sunday for me.